Singer Cafe , Beit Sahour, Palestine. Information, Photos and Reviews. 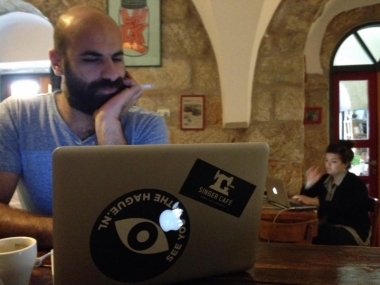 Singer Cafe is a meeting place for Palestinians and foreigners. It has the best coffee in town and a variety of sandwiches, salads, soup of the day and the traditional Palestinian breakfast. We also serve (local) beer and wine and fresh juices, smoothies and milkshakes. 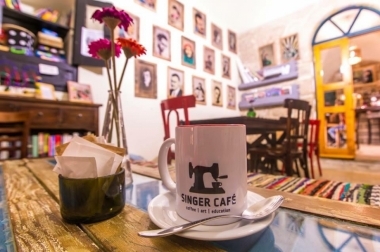 Singer Cafe is run by a Palestinian - Dutch couple. 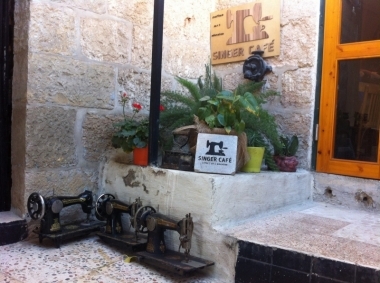 The name of the Cafe is inspired by the decoration of the Cafe with old Singer sewing machines. The Cafe is located in the old part of the town of Beit Sahour in an old building with the particular natural stones and a high vaulted ceiling. The interior of the Cafe consists of second hand and recycled furniture. Singer Cafe has a library with English and Arabic books and some toys and books for children in a non-smoking part of the building. There is a roof with an amazing view over Beit Sahour towards the desert and the Dead Sea. 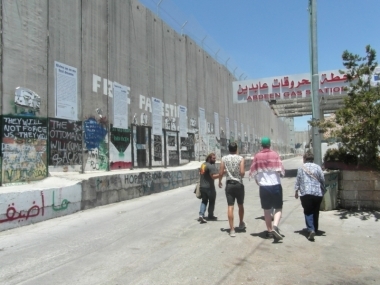 Foreigners who are planning to visit the Westbank or who are already in the country can take part in the day trips that we organize regularly. 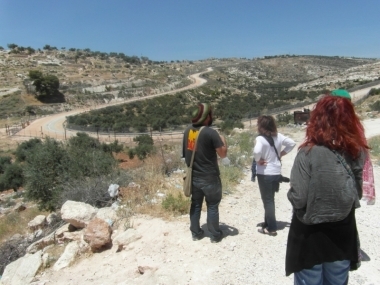 We offer geo-political reality tours and an Art Walk in the old city of Beit Sahour. 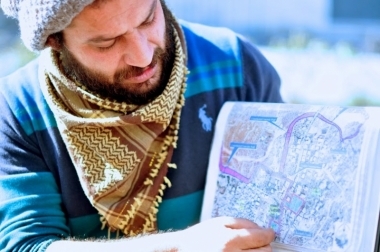 We will be happy to help you planning your stay in Palestine and advice you on possibilities for hosting, logistics, places to visit, things to do and people to meet. Just show up at Singer Cafe and ask for our assistance. Or write us an email in advance and we will be glad to answer your questions. Nobody has reviewed Singer Cafe yet, Be the first. You are submitting a booking enquiry. Singer Cafe will then contact you by email with details of availability and prices.